We stock the very best protection for you to be the safest possible rider: Fox helmets, Troy Lee knee, shin, and elbow pads — just to name a few. We also carry Leatte neck braces, 100% goggles, Five Ten shoes, and more items for the enduro rider. Consider us an emergency room for bikes. 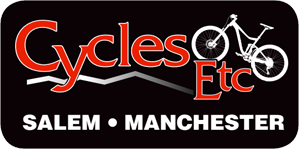 Our technicians are highly skilled and trained to get your bike back on the mountain as quickly as possible. Our rental fleet includes Downhill, Freeride, Dirt Jump, Enduro and Fat bikes for all ages, all ready to shred the park. Included With Online Bike Rental? How can I rent a bike at Highland? Ready to ride some downhill? New to this whole thing? Well, we’ve got an extensive Park Ready Rental Fleet waiting for you. Even if you’re not sure what you need, our experienced and knowledgeable Demo Center staff will set you up with the right bike for your needs! Email bikeshop@highlandmountain.com for more information. Pay $120–$140 to rent a bike for the day. To view available bikes, click here. Pay $120–$140 to rent a bike for the day, with the option to demo one additional bike during the day. Pay $50–$55 to demo one Highland Demo Center bike for two hours. What do I get with a Find Your Ride? Based on availability and sizes, we will set you up with a Specialized Enduro Comp. Kids’ bikes will vary based on availability and size. How long do I have to demo a bike? You may demo a bike for two hours at $45, or for the entire day at $120. Reservations are highly recommended. Please email the bike shop at bikeshop@highlandmountain.com with any questions. You will need a valid credit card and driver’s license to rent any bike and are responsible for any damage incurred during your rental period. Can I swap components on the bike? Our skilled Demo Center staff will be happy to install your pedals and help you set up your seat height and suspension. No other modifications will be permitted! Once you buy your new bike though, we’d be happy to help you customize it!. Do I need a waiver or lift ticket? Yes, you need a valid waiver on file no matter what. Please see our waiver policy, especially if you are under 18. Cross country trails are free to the public, but you will need to purchase a day pass to utilize the lift-access trails and jump park. Can I purchase a Demo Center bike? Where can I purchase a new bike? Any of our Rental Bikes can be taken for a two-hour demo. Below are details about the Demo program. Prices are listed above. The Demo program is designed for the customer looking to make a purchase or try multiple bikes. The Highland Demo Center is your one-stop-shop to demo a bike you are thinking of purchasing from one of our partner shops. Thanks to partnerships with a number of top industry manufacturers and retailers, Highland is proud to bring you one of the most extensive fleets in North America. After the two-hour demo is complete and you want to ride a second bike, you may do so based on availability. Purchase a NEW 2019 bike and Ride FREE! *Purchase must be made at a participating dealer to receive discount. **To receive your free Highland pass products, you must purchase from a dealer with the same make and model of the new 2019 bike currently in the Highland Demo Center Program. ***Pass products have no cash value and are non-transferable. Participant must adhere to all Highland waiver policies.